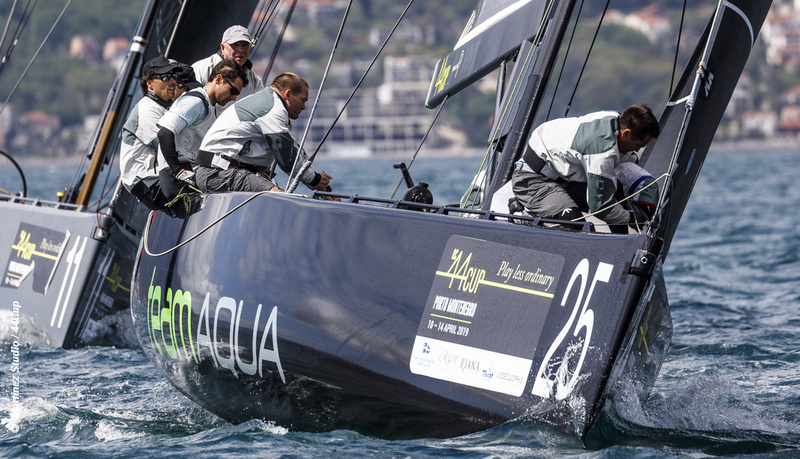 Igor Lah’s Team CEEREF comfortably won race two and holds the lead overall by two points at this halfway stage after a challenging second day of racing for the 44Cup Porto Montenegro. Kirill Frolov’s Bronenosec Sailing Team appeared to have the first race squared away, with a massive lead on the final run, only for her gennaker to blow up. The Russian team salvaged a fifth but then had to send a crew aloft to release the halyard and drop the head of the blown sail. In race three Chris Bake’s Team Aqua, on which keelboat legend Peter Morton was helming, won by prevailing in a three way photo finish alongside Hugues Lepic’s Aleph Racing and Tavatuy Sailing Team, who remain on a steep learning curve at this, their second ever 44Cup event. This was only his second ever in the high performance one design class. Team Aqua’s 2-4-1 made her best scoring boat, elevating her to second overall ahead of Peninsula Petroleum. With two days of racing left, just three points separate the lead trio, but there is a now a significant seven point gap back to Vladimir Prosikhin’s Team Nika, now holding fourth place after a disappointing day. To make matters worse Team Nika has both their two time Melges 32 World Championship winning compatriots on Tavatuy Sailing Team and Nico Poons’ Charisma nipping at their heels, within two points of them.